RDPOA’s pocket badge is personalized for each member in so far as depicting the state seal of the state from wherein the member’s agency is located. 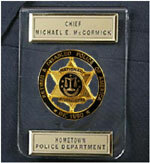 The pocket badge is mounted on clear plastic containing RDPOA’s badge and two nameplates. The top nameplate contains the name and rank of the member and the bottom nameplate contains the agency from which the member is retired. RDPOA’s pocket badge is a high quality device that you will be proud to wear. Priced at just $60.00, including shipping and handling. Click HERE to Order Your Pocket Badge.